San Marco by Segafredo are Nespresso compatible coffee capsules which can be used in a wide range of Nespresso compatible coffee machines. 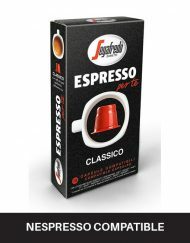 Enjoy a Segafredo coffee in your Nespresso capsule machine. Nespresso® trademark is owned by Societe Des Produits Nestle SA. Order online and have your capsules delivered to you New Zealand wide.